Looking for promotional products that are attention-grabbing and budget-friendly at the same time? 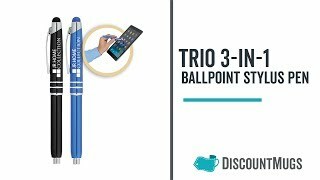 Then get your hands on these promotional trio 3-in-1 ballpoint stylus lights! Our stylus pens feature a rubberized capacitive touch technology stylus tip with light that is activated by an on/off click. The stylus is ideal for touch screens including smart phones and iPads, as well as everyday use touchscreens such as atm machines! These pens are constructed from top-quality aluminum materials that's guaranteed to last! So worry no more as these stylus pens will take care of your promotional needs! Just customize them with any logo, or text of your choice and you're all set! Our online design lab here at Discountmugs.com is always ready to assist you with all of your customizing concerns! Order these promotional trio 3-in-1 ballpoint stylus lights from us today and enjoy our 110% lowest prices guarantee!